Phoenix is home to many businesses. Having your business headquartered in Phoenix gives it an opportunity to market and expand across the valley. Most entrepreneurs start off at home, before they relocate their business to bigger and more marketable areas. Once your business and clientele grows, you might be in need of a bigger space from which to conduct your business. Finding a new office, retail location, salon, or a clinic space that fits your specifications in Phoenix can take quite a toll on someone. Depending the kind of business you have, the commercial space you are getting might need a few renovations. Having an experienced and professional general remodeling contractor handling your tenant improvements is what you need in order to move into your new space on time and without losing a profit. Valcon General excels at commercial remodeling projects in Phoenix, and has built an impressive resume all across the Valley. Valcon General has the expertise to create the space you will be proud of, on time and within your budget. Whether you are building a new office space, renovating a retail store or remodeling your existing space to better accommodate your current situation, the contractors at Valcon General can do the job. Over the course of ten years, Valcon General’s owner, Perry Villarreal, has developed an insight on the general expectations of his clients. Most expectations and requirements are similar, however each business owner runs their company differently. The builders of Valcon General will sit down with you, discuss expectations from both sides, and develop a plan that will make your renovation as painless as possible. Nowadays, everyone wants to have a unique look that separates them from the rest. In Phoenix, Valcon General has the perfect commercial business contractors for the job. Valcon General’s owner, Perry Villareal, decided to following his passion after years of experience, and started the general contractor company that would change the shape of many businesses. We support the promise of making your dream a reality. With just a phone call, you can explain to us what your expectations are for your commercial office renovation to start planning step by step on how to make it happen. Our client’s satisfaction is above everything else. We fully understand that every for commercial remodeling project, the clock is ticking, and in most cases, clients only have a certain amount of time to get their tenant’s improvements completed so they will not have to interrupt their business and will not lose sales and profit. Valcon General’s approach to tenant improvement projects is to make sure that we fully understand exactly what the client’s needs are regarding their project goals, visions, and timetable while keeping their budget in mind. By using this unique approach, Valcon General can hit the ground running to ensure that the project is done on time. Valcon General will make all your clients feel right at home with our Salon and Spa business renovations. Customers like to be comfortable when receiving a haircut, pedicure, or another beauty service. We are capable of doing just that and more. Our professional dental office contractors will renovate any furniture that is starting to fall apart, making them more durable and beautiful than before. If you want to do a complete overhaul, we have the best commercial remodeling contractors for you! Don’t know what to do with your law office? You can contact us for some recommendations from our experienced interior business contractors. We are more than happy to help you have unique renovations for your co-workers. Restaurants tend to have their tables or chairs ruined because food and drink spills, overuse, and more. Whenever you start to feel that the furniture in your business is starting to look old or out of place, Valcon General is the perfect choice for a business renovation. Over time, your storefront’s appearance might not be the same as when you began your business. To attract more customers, our professional remodeling contractors will work with you to achieve the design you want and transform your storefront into a beautiful hook to bring in more business. Retail stores can attract customers with their new products, but the first look is what counts more. We have years of experience doing different commercial business remodeling, so if you don’t have a design in mind, we can help you design and create something unique. 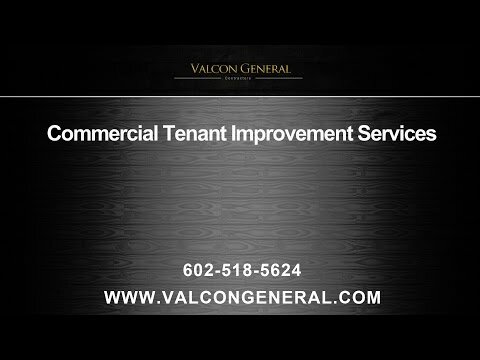 If you are looking for a general commercial contractor in the Phoenix Valley, Valcon General can provide the contractors for you. Perry Villareal has over 25 years of experience in the construction industry and he has the knowledge and understanding of the expectations that potential clients tend to have. Valcon General can get your office renovations completed on time and within the expected budget without sacrificing quality for time. Finding the perfect general contractor for tenants near you is your first step to bringing your dream renovation to life. Valcon General is the Phoenix commercial remodeling contractor for you.